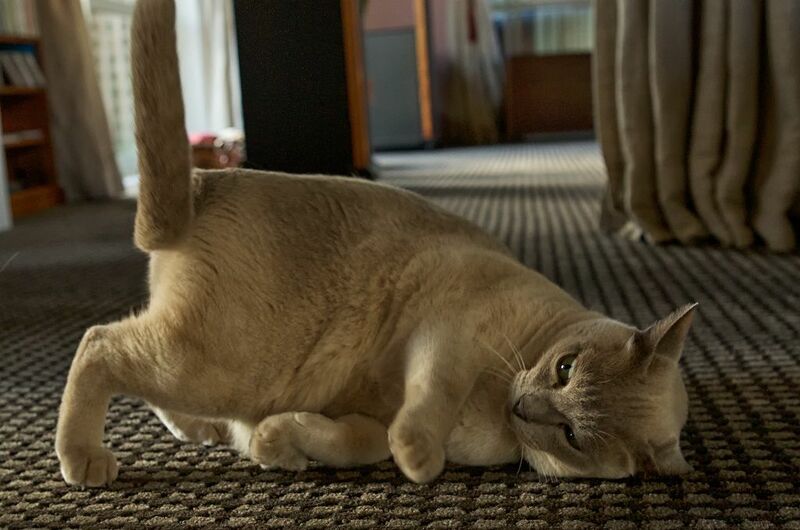 Although I usually blog about my dogs, I actually have two earthquake rescue, elderly Burmese cats. They are both gorgeous boys! Buster, appears to be faulty though, something wrong with his equilibrium perhaps? We have found that you only have to look like you are about to talk to him, and he falls over. Eventually he’s all legs in the air, on his back… waiting for the maybe, possible, if he’s very lucky, tummy rub. At times, he doesn’t even make it into a full flop, he starts to do the fall and just ends up with his head on the ground, looking every so slightly… ok very… foolish. Meeko loves to be brushed… or does he? The angry growling he does while being brushed is in complete contrast to the purring and smooching that goes on at the same time. He prowls around the living room while we weild the brush, growling and purring and rubbing up and down us and the furniture. Eventually he rolls over, asking for his belly to be brushed and its 50/50 whether you will be licked or clawed. Life with be very dull without these furry beasties.